Anita's favourite foods are fruit and vegetables. Can you help her through this maze avoiding all the unhealthy food and collecting all the healthy food on the way? 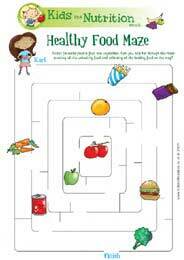 Why not Download the Healthy Food Maze and see if you can help Anita find her way. This activity is aimed at 4 to 7 year olds, it's a fun way to raise your child's interest in healthy eating, as well as building their problem solving skills.